I bought and am using the Clarisonic Aria I featured yesterday but another very popular one is the Luna Facial Cleansing Brush by Foreo. The Luna is a Swedish product and is made of silicone. You can see the minimal Swedish aesthetic coming through in the design of this product. You never need to replace a brush head plus the silicone bristles are easier to clean and keep hygienic. It comes in various models – for men, a mini size, and different colours for different types of skin. 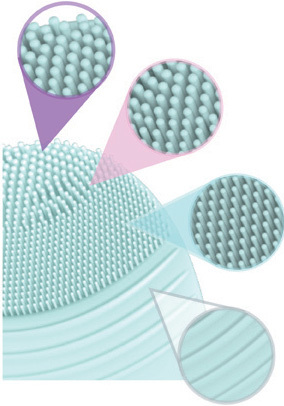 On the back of the regular sized Luna there are ridges which you can use to massage your serum into your skin. You can also buy professional brushes. Luna also make silicone-bristled toothbrushes which are groundbreaking. The Luna is known as being more gentle and easier to clean than the Clarisonic, and the brush never needs replacing. Plus it only needs to be charged every 6 months or so. But for me, I want proper exfoliation so I bought the Clarisonic I featured yesterday. Mini to the left (comes in several colours but only one bristle constellation) and the regular to the right (comes in three colours, each with a different bristle constellation for a different skin type. There is also a black one for men. This is the professional set, designed for a beauty therapist to use two at a time – one in each hand.